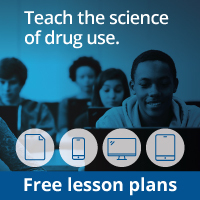 Read the Background section of this module for more information about the effects of prescription drugs and inhalants on the brain and body. Provide students with the Module 3 magazine Drugs in the Cupboard for background knowledge. Photocopy and pass out the Prescription Drugs, Inhalants, and the Brain Fact Sheet for students to complete during the lecture. Gather colored paper for Activity 1. Discussion: After students have read the magazine, facilitate a discussion about the brain using the following questions. If necessary, review this information with your students using the diagrams provided. Who should take prescription drugs? When? What are the three classes of prescription drugs? Should a person use a prescription drug that has been prescribed for someone else? How does inhalant use injure the brain and body? What is the name of the insulation around neurons that is damaged by inhalants?